Subelement specific practice tests have been added to the free ham radio practice exams at http://copaseticflows.appspot.com/hamtest for the United States amateur exams. 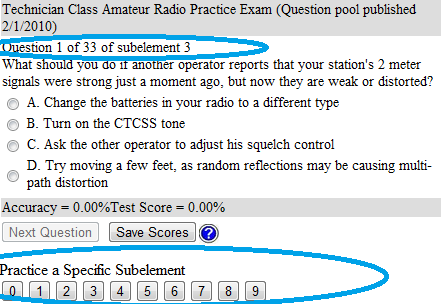 To study a specific subelement press the button, (look below the question area), that corresponds to that subelement. A new test will start specific to that subelement. The questions that appear in the exam will be only the questions for that subelement in numerical order. The exam header will have a message reminding you that you are studying for that subelement and not practicing a full exam. As always with new features, if you see anything new or old that looks broken, please contact me at hcarter333@gmail.com. Have fun!